Many people can see some validity or value in this statement, but it may seem strange to them to incorporate this component into business practices or corporate culture. After all much of what is common practice does not reward or encourage those who choose to be truthful. But as Bob Dylan so aptly put it, “the times they are a-changin’”. The environment, our capacities as human beings, and our tools to interact with the world are constantly evolving and growing. Yet much of what we do today is based on assumptions about human nature arrived at hundreds or even thousands of years ago when we had less knowledge and understanding about the world and ourselves. Along with the rest of the universe we are evolving as a human species, as such it only makes sense that our higher understanding and knowledge inform our decisions and practices, so we can keep progressing forward. OpenAgile recognizes the true nature of humanity and how it can work to create a remarkable world in every endeavour. Scientific discovery is revealing this truth about our nature as well, as the video below so wonderfully illustrates. Be Open, Be Agile, Be Free. The Definition of “Done” for a Scrum Team makes transparent how close the team’s work is coming to being shippable at the end of every Sprint. Expanding the Definition of “Done” until the team is able to ship their product increment every Sprint is a process that every Team Member helps advance. Team Members expand the Definition of “Done” by learning new skills, developing trust and gaining authority to do work, automating repetitive activities, and finding and eliminating wasteful activities. When every Team Member is systematically expanding the Definition of “Done”, the team builds its capacity to satisfy business needs without relying on outside people, groups or resources. If Team Members are not actively working on this, then many of the obstacles to becoming a high-performance team will not be discovered. Product Backlog Items are brief descriptions of a feature or function. Usually they are short enough that they could be hand-written on a small note card. This brevity is meant to be just enough information so that the Product Owner and the team can use the PBIs as invitations to conversations. The resulting conversation (ongoing, evolving and involving the whole team and stakeholders) and the shared understanding that comes from that conversation is where the real value of the PBI resides. Part of the conversation occurs when the Product Owner initially writes the PBI so that the team can estimate the effort of building it. Part of the conversation is the actual work being done during a Sprint. Another part of the conversation is during the Sprint Review when stakeholders see the results of the team building the PBIs. If one creates PBIs as detailed specifications then we are essentially handcuffing the team into a set path and a prescriptive solution. The reason we hire qualified people onto our Scrum Team is for their knowledge, experience, and problem solving abilities. If we lock them into a set path, then we are literally turning them into cogs in a machine to spit out specific code. PBIs that are invitations to conversations allow them the flexibility to figure out how to solve the problem by engaging in a conversation on what is needed. Product Backlog Items are ordered into a sequence in the Product Backlog in such a way that the Product Owner is able to maximize the return on investment (ROI) in the team. The very first PBI in the Product Backlog should be the one with the highest expected value considering the effort to build the PBI. There are many ways to calculate this expected value including Return on Investment (ROI), Net Income After Taxes (NIAT), Net Present Value (NPV), etc. The Scrum Team members should be free to ask why one PBI is prioritized higher than another, and the Product Owner should be able to give a reasonable answer. Since the entire Scrum Team is accountable for its work, it is in the best interest of all members of the team to use expected value, so that both the Scrum team and the customer will be committed to the work that is currently being worked on and the upcoming work in the future Sprints. If we don’t order the PBIs by expected value, then the Product Owner is likely to prioritize them based on dates, feelings, urgency, or other less valuable methods. These other prioritization methods will diminish the trust of the team in the Product Owner and may lead to morale problems. Any group of people that wish to be an Agile Team need to take the initiative to determine for themselves how they are going to work (process) and how they are going to do the work (product). The term “team” really applies quite broadly to any size group of people that are working together towards a common goal. Teams go through stages of development as they perform their work. The most important result of team development is the team itself, and not the specific skills and abilities that the individuals learn. If the team is part of a broader organization, that organization must give the team the authority, space and safety to learn to be self-organizing. The organization’s leadership is responsible for determining the “why?”, some constraints on “how?”, and then letting the team respond to the need as best as it can. Also Known As: Whole Team (Extreme Programming), Cross-Functional Team (business management). Agile Work uses short fixed periods of time to frame the process of delivering something of value. Each of these iterations or timeboxes is structured so that the team or group actually finishes a piece of work and delivers it to stakeholders. Then, the team builds on what has previously been delivered to do it again in the same short amount of time. The sooner that valuable results can be delivered, the more value can be obtained from those results. This extra value is derived from opportunities such as earlier sales, competitive advantage, early feedback, and risk reduction. There is an explicit tradeoff: the shorter the time to delivery, the smaller the piece of value will be. But, like investing in one’s retirement account, the earlier you start, even with small amounts of money, the better off you are in the long run. Also Known As: Sprint (Scrum), Iteration (Extreme Programming), Timeboxing (generic), Time Value of Money (accounting). Every type of work is governed by a Horizon of Predictability. Any plan that extends beyond this horizon of predictability is bound to fail. Agile work uses an explicit learning cycle tied in with the planning of work to accomodate this inevitable change. First, a goal is required. This goal can be long-term. Teams using Agile Work then create a queue of work items to be done in order to reach this goal. Each iteration, some of these items are selected, finished and then the queue is adjusted. The changes in the work queue are based on external factors, and learning that the team does as it goes. One of the most effective methods for the team to learn about how it is doing its work is the retrospective. 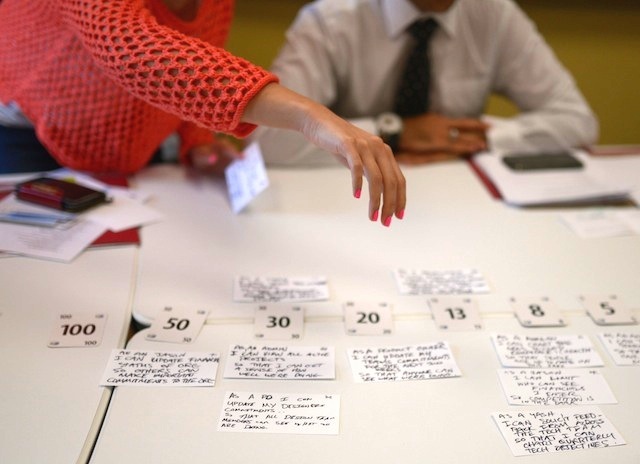 After each delivery of results, the team holds a retrospective to examine how it can improve. Also Known As: Inspect and Adapt (Scrum), Kaizen (Lean), Adaptive Planning (generic). A team needs to have effective means of communicating, both amongst team members and also to stakeholders. To Communicate Powerfully, a team needs to prefer in-person communication over distributed communication. Synchronous over asynchronous communication. High-bandwidth over low-bandwidth communication. Multi-mode communication over single-mode communication. The results of failing to communicate powerfully include wasted time for waiting, misunderstandings leading to defects or re-work, slower development of trust, slower team-building, and ultimately a failure to align perceptions of reality. The single most effective means to communicate powerfully, is to put all the team in a room together where they can do their work, every day for the majority of the work time. Some types of work do not lend themselves to this approach (e.g. creating a documentary video), but every effort should be made to improve communication. Also Known As: Visibility (Scrum), Whole Team and Team Room (Extreme Programming), War Room (business management). Defects are one of the most critical types of waste to eliminate from a work process. By testing everything, by driving all the work of a team by creating test cases to check the work, a team can reach extremely high quality levels. This ability to prevent defects is so important that only an executive level decision should be considered sufficient to allow defects into a work process. Quality is not negotiable. In Agile Work, removing a defect is the only type of work that takes priority over any new features/functionality/production. If the end result desired is to maximize value, then removing defects is an important means to that end. A team has an ethical duty to discover new ways to effectively test their work. This can be through the use of tools, various feedback mechanisms, automation, and good old problem-solving abilities. Also Known As: Canary in the Coal Mine (Scrum), Test-Driven Development (Extreme Programming), Defects per Opportunities (Six-Sigma). Since Reality is Perceived, it is important for an agile team and organization to have a clear method of describing and perceiving what is important for the organization. Measuring value is a critical method for describing and perceiving what is important. A single metric can be used to drive all the measurement and goal-setting and rewards in an organization. All other measurements are secondary and must be treated as such: limited in use and temporary. There are many things which are easier to measure than value. It is often easy to measure cost, or hours worked, or defects found, or estimate vs. actual… etc. However, all of these other measurements either implicitly or explicitly drive sub-optimal behavior. Also Known As: Measuring Results (Scrum), ROI (business management), Economic Driver (Good to Great), Running Tested Features (Extreme Programming). Everyone in an organization using Agile Work takes responsibility for clearing the path, removing the obstacles that prevent work from being done effectively. Clearing the Path doesn’t just mean expedient, quick fixes to problems, but rather taking the time to look at an obstacle and do the best possible to remove it permanently so that it never blocks the path again. In the Agile Work method, the Process Facilitator is the person who is responsible for tracking obstacles and ensuring that the path is cleared. To do this, the Process Facilitator maintains a Record of Obstacles. Clearing the Path is sometimes painful work that exposes things we would rather not deal with. As a result, it is critical that people build their capacity for truthfulness and work to develop trust amongst each other. Building a capacity for truthfulness is not something that can be done by using an explicit process. Also Known As: Removing Obstacles (Scrum), Stopping the Line (Lean). 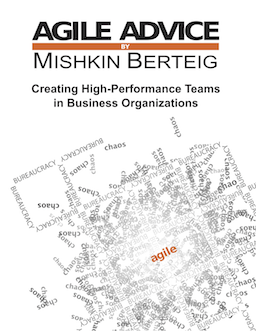 Remember also, that these practices must always be viewed and implemented in the context of the Agile Axioms. These axioms provide a check to ensure that the practices are not being applied blindly, but rather applied appropriately to the given situation. Work can often be divided up so that the smaller pieces are valuable on their own. By dividing work this way, a team can deliver value incrementally. The team can choose a short period of time called an iteration and select a small amount of work to complete in that time. This work should be valuable on its own. For example, if a team is building something, then at the end of each iteration whatever is built is usable as it is. This means that each iteration includes all the planning and design as well as construction or creation necessary to deliver a final product or result. For example, a volunteer group may desire to attract new members. A non-agile approach would have the group plan their membership campaign completely before actually executing on it. 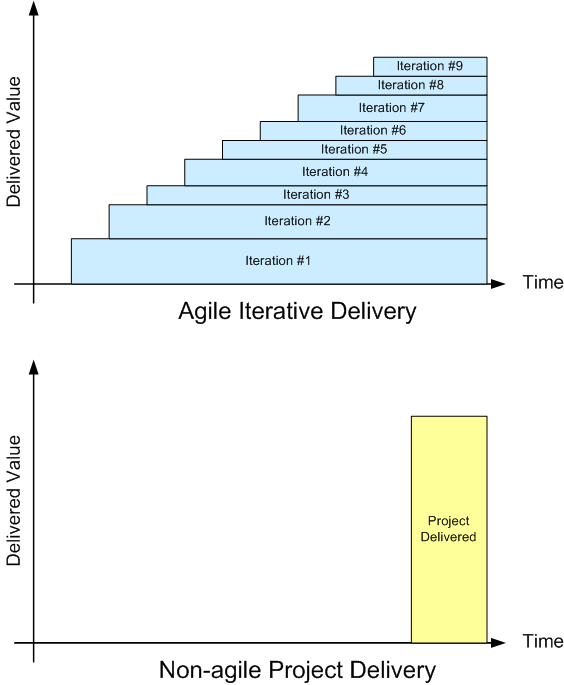 An agile approach using iterative delivery would have the group plan a small piece of work that will attract some small number of new members, execute it, and then start a new iteration. One iteration may cover the creation of and delivery of a door-to-door flyer in a neighborhood. Another iteration may cover the design, creation and publishing of a small advertisement in a local newspaper. Each iteration includes all the steps necessary to produce a furthering of the group’s goal of attracting new members. One can see clearly from the diagrams that the non-agile delivery of value at the end of a project is also extremely risk prone and suseptible to change. If the project is cancelled just before it delivers, then a fairly substantial amount of effort is wasted. In the agile iterative delivery situation, an endeavor can be cancelled at almost any time and it is likely that substantial value has already been delivered. Even if the work cannot actually be delivered incrementally, it almost always can be divided in a way so that it can be inspected in stages. Either method of dividing work allows us to do the work in iterations. Iterations are fixed and consistent units of time during which work is performed and between which planning, inspection and adjustment is done. The empowered team will decide on the length of iterations for their work. As a rule of thumb iterations should be shorter than the horizon of predictability. Generally, iterations should never be longer than one month, no matter what the endeavor. At the end of each iteration, a demonstration of the work completed is given to the stakeholders in order to amplify learning and feedback. Between iterations, the stakeholders collaborate with the team to prioritize the remaining work and choose what will be worked on during the next iteration. During the iteration, the stakeholders need to be accessible for questions and clarifications. Iterative and incremental delivery is used to allow for the early discovery and correction of mistakes and the incorporation of learning and feedback while at the same time delivering value early.